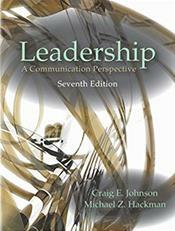 Leadership: A Communication Perspective has been at the forefront of university and college leadership courses for nearly three decades, providing a compelling, authoritative introduction to leadership as a communication-based activity. The new edition continues the tradition of excellence with an up-to-date treatment of theory and research combined with practical, real-world advice for improving communication competence and leadership effectiveness. The authors profile contemporary leaders and organizations like Alibaba's Jack Ma, Zappos' Tony Hsieh, Facebook's Sheryl Sandberg, Uber, The Container Store, Airbnb, Chipotle, the Waffle House, Nordstrom, and Google. Their presentation balances current scholarship and trends with historical perspectives to provide a fuller understanding of the study and practice of leadership. Leadership and followership are examined in multiple contexts, including organizational leadership, public leadership, and leadership in groups and teams. Topics new to this edition include transcendent followership, the leadership skills approach, team coaching, escalation of commitment, invisible leadership, cultural intelligence, trigger events, and resilience.